Anyone that knows me will tell you I am a Chuck Taylor guy. I have been since I can recall. I am still amused by the memory of my first pair. It was the eve of the opening day in first grade. My mother had taken me to the mall to get some last moment items; cigar box, #2 pencil and tennis shoes. I remember the look on the salesman’s face when I marched up to him and asked if they carried those “high heeled” sneakers. After several minutes of laughter sharing the moment with his sans-a-belt slacked sales cronies, one posed the question that brought of rush of blood to my face, “you mean high topped sneakers?” I hated those men. They were black, the shoes that is. I believe your only other choice at the time was white. I remember being so excited that night that I wore the new Chucks to bed. After a night of tossing and turning, I awakened wrapped tighter than King Tut. I digress; the point is Chucks have been my longboarding shoe of choice for years. I tried regular skate shoes but found them to bulky for extended push sessions. The down side to the original All Star is twofold. The first issue is the lack of support in the insole. After a 5 mile descent on Colorado chip seal I could not get to my flip flops fast enough. The second issue is the lack of padding in the tongue. Longboarding consists of kicking, breaking and carving. What can I say….pressure points happen? 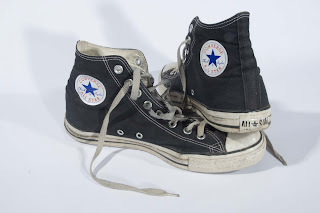 And then there is the thing the tongue does when it slides off the top of your foot and settles on the side of your foot………….enter Converse CTS. When Nike purchased Converse I was one of the harshest critics. But then it occurred to me,……….I had friends at Nike. Moments after I saw the CTS “Chuck Taylor Skate” I was on line shopping. www.tactics.com is my online retailer of choice for skate and snowboard fair. But to my dismay they only had black and white………I bought them. Next I placed a call to my buddy at Nike. After a day of searching and some calls to his buddies at Converse he informed me that the black with the yellow runners where in the way. I love that man. When I received my much awaited package it contained an extra leather pair of the CTS’s. Oh happy day. I have been wearing the shoes for the better part of two weeks and absolutely love them. The support is fantastic. They are some of the most comfortable shoes I own. 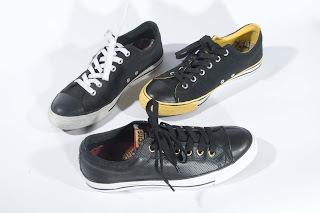 They have a narrower profile than most skate shoes but are not as narrow as the vintage Chucks. The tongue has the perfect amount of padding unlike most skate shoes that look like they have had an allergic reaction and it stays in place. But the best part is they look like the Chuck Taylors I have loved the majority of my life. Well done Nike/Converse I look forward to my next pair, the flame orange……yeah baby.